Experience the best of the Pacific Northwest on your Seattle vacation. Get active exploring Puget Sound and the Cascade Mountains, examine Indian art and natural history in one of many museums or feast on fresh-caught seafood. Use your Seattle hotel as a base for discovering this Pacific coast jewel. Harmonious oil paintings, screaming Hendrix riffs, delicate silk weavings and hot glass-blowing – Seattle’s museum experience is as diverse as its residents. Explore the city’s best from your Seattle hotel base. A summer vacation in Seattle sees orcas return to Puget Sound, snow-capped Mount Rainier emerge from its winter cloud cover and café goers flock to the street-side tables of Pike Place Market. 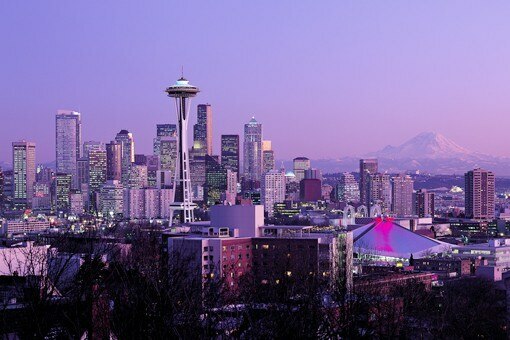 Use your hotel in Seattle as a base and watch Seattle come alive with the sun. Take your pick from hotels overlooking Puget Sound, the Cascade Mountains or the city skyline with this guide to the top 10 hotels in Seattle. Choose the right Seattle hotel for your visit to Washington’s largest city. Use this guide to uncovering where to stay in Seattle. A short getaway in Seattle will give you only a taste of the city. But this itinerary will help you see the city’s highlights, just a short distance from your Seattle hotel.